Una artillería autopropulsada experimental sobre el chasis de T-26. Varios vehículos y 8 chasis blindados fueron fabricados. Nunca entró en la producción en masa. 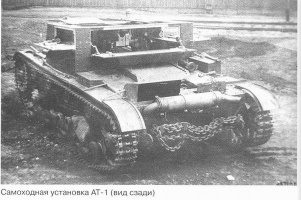 The AT-1 marks the beginning of the Soviet tank destroyer line. It is quite maneuverable for a tank destroyer, has good acceleration, and can turn on a dime. The AT-1's 57 mm ZiS-8S is a Tier 4 gun that can destroy Tier 2-3 tanks with rapid-fire volleys. Unfortunately, it has a deplorable view range, so it cannot snipe at all without spotters. Very small silhouette and good camouflage values. Terrible view range (one of the shortest in the game). The AT-1 has some of the most powerful guns available at Tier 2, balanced by its atrocious view range, long aim times, and poor armor. Unlike the American T18, with its fantastically thick 51 mm of armor, the AT-1 is poorly suited to the assault gun role, with even worse armor than its predecessor, the Tier 1 MS-1. To start with the AT-1 receives the 45 mm 20KS, which for all intents and purposes is the same as the 45 mm mod. 1932 on the MS-1, except with somewhat better aim time and accuracy. It is quite adequate against most Tier 2 tanks, but will struggle against the T18's frontal armor. The 37 mm ZiS-19S is significantly more accurate and has somewhat more penetration, but also deals slightly less damage. The 76 mm L-10S is a very powerful gun, with damage comparable to a tier 5 TD, comparable to the T18's 75 mm Howitzer M1A1. Unfortunately, like all howitzers, it is very inaccurate and has a long aim time. While the T18 can nullify these disadvantages using its excellent armour at close range, the AT-1 cannot. 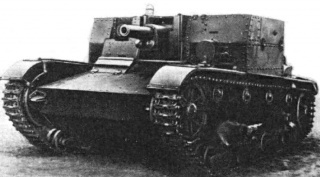 However, the L-10S on the AT-1 can be used as a form of pseudo-artillery, especially with HE rounds. The 57 mm ZiS-8S is probably the best weapon for the AT-1. With 75 mm of penetration, it is easily capable of dispatching any tank the AT-1 will normally encounter, but is not as accurate and has a longer aim time than the ZiS-19S. Mobility-wise, the AT-1 is quite good. It turns better than the T18, though it is not as fast in a straight line. This can occasionally be very helpful, especially at the fast pace at which Tier 2 and Tier 3 matches tend to take place, although close combat in the AT-1 is to be avoided. The AT-1 has thin 15 mm armor that is almost vertical, with nearly no sloping. Bouncing an enemy projectile is a very rare event, and even with 230 HP, the AT-1 absolutely cannot afford to take hits. Probably the AT-1's greatest weakness is its view range. 250 m is one of the shortest view ranges in the game, and the AT-1 is almost completely dependent on other tanks to spot targets for it. No modules carry over from the MS-1, but the engines can be researched on the T-26. The 37 mm ZiS-19S is not required to unlock anything and is not used on future tanks, so it may be skipped entirely. The AT-1 bis suspension is required to mount the L-10S and all but the lightest of equipment, and should be researched first. Priority should then be given to either the 76 mm L-10S or the 57 mm ZiS-8S first for a dramatic increase in firepower. The ZiS-8S is also required to unlock the SU-76. The T-26M engine provides negligible benefits, and it will be more economical to simply wait to unlock and buy the final T-26F engine. 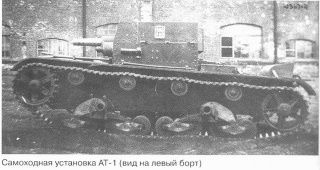 The AT-1 was an self-propelled gun ('AT' stood for 'Artilleriskiy Tank' - 'Artillery Tank') in reality, not a tank destroyer. Thus, there is no history of the AT-1 as a tank destroyer. See http://en.wikipedia.org/wiki/T-26_variants. Also note that none of the guns that it carries in the game were even considered for it in reality, with the L-10S-armed version coming closest to the real AT-1. Esta página fue modificada por última vez el 25 oct 2016, a las 11:05.